To help promote my electropop duo Infernal Devices‘ EP A Million Miles Above, we wanted to create a way for people to listen the new EP in a way that would be a step beyond a simple audio player, while also persuading people to see us perform live with our new lighting rig we called The Phenomatron. 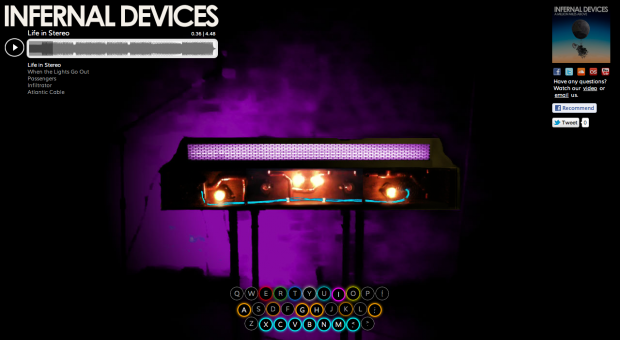 I made an interactive experience for the user where they can control the show in the browser and make the lights on the Phenomatron go along to the music. I used the Soundcloud API to stream the new EP from Soundcloud along with HTML5, CSS3, and jQuery to create the Virtual Phenomatron light up to the users’ keystrokes. Try it yourself at infernaldevices.tv/phenomatron. © 2013 Andy Miccolis. All rights reserved.